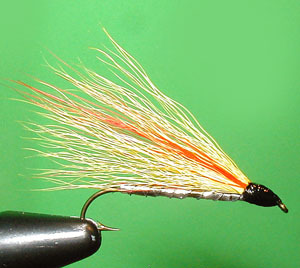 From what t I have read this traditional streamer was named after the infamous drugged drink (“Mickey Finn” is a drink that is meant to render its drinker unconscious). 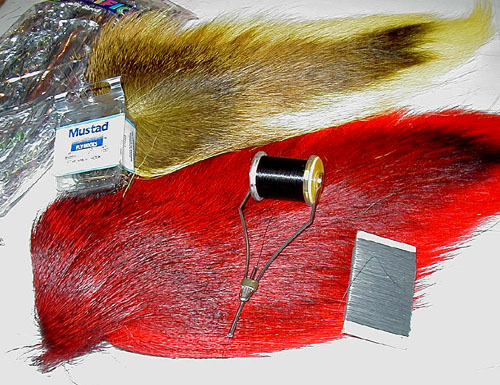 Having stood the test of time this streamer, like most, is designed to imitate a baitfish, and once the beginner learns to tie this pattern they will have the necessary skills to tie a host of other bucktail and hair-winged streamer patterns. 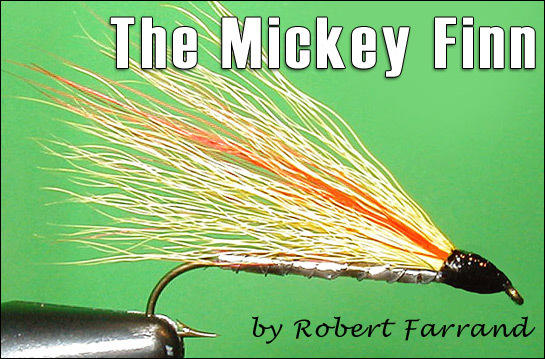 The Mickey Finn, like most hair-winged streamers, can be used to catch a wide variety of fish species from salmon and trout to your lesser species like Bass (Just kidding) LOL. Step 2: Tie in about 3 inches of thin craft wire. 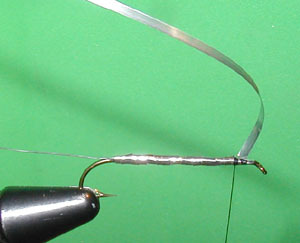 Step 4: Wrap the tinsel back to the end of the thread wrap, near the bend of the hook and back to the front, leaving no gaps where you can see thread or the hook shank. Tie off and trim near the place where the wrap was started. 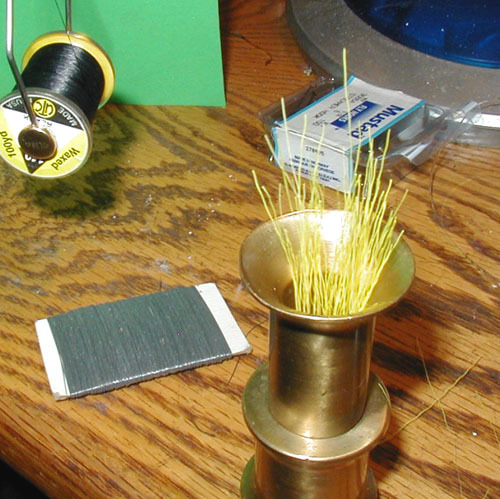 Step 6: Using you hair stacker place a small amount of yellow-dyed deer tail hair into the stacker, tips first. Tap the hair stacker on the table to allow the hairs to even themselves at the base of the stacker. 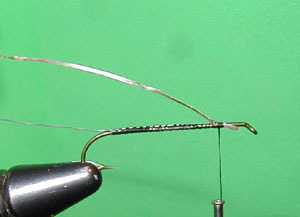 Step 7: Carefully take the stacker apart, retrieve the stacked hair from the stacker and tie it onto the hook as shown. 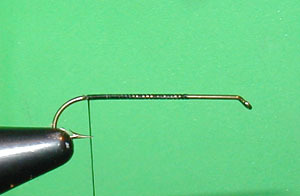 The tips should go just slightly past the bend in the hook. Step 8: One common mistake made by beginners is trying to use too much hair when only a small amount is needed. Trim the yellow hair at an angle; this will allow the thread to be smoothly wrapped up onto the hair once the fly is finished. 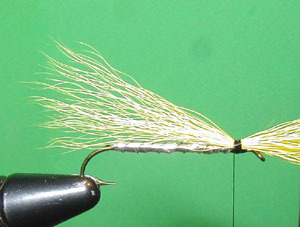 Stack a small amount of red deer tail just as you did with the yellow; place it on top of the yellow hair and tie in and trim (on a angle). 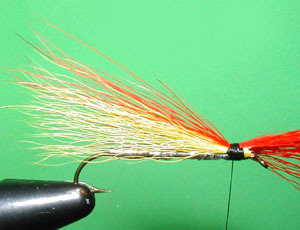 Try to keep the colors separate to give the fly the look of a baitfish with a red lateral line. 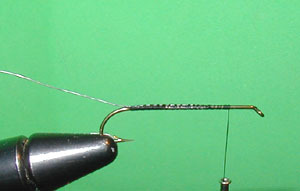 Step 9: Repeat this process with the yellow bucktail. 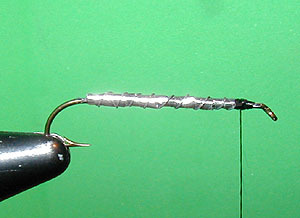 Once you have trimmed the yellow bucktail finish by wrapping a smooth head, starting behind the eye of the hook and wrapping over the trimmed ends of the bucktail, then whip finish and cement. I believe that the proportions of the wing are not as originally designed. The first batch of yellow hair and the batch of red hair are the same size (not too big). The top yellow part of the wing is equal to the size of the first yellow and red batches of hair combined.